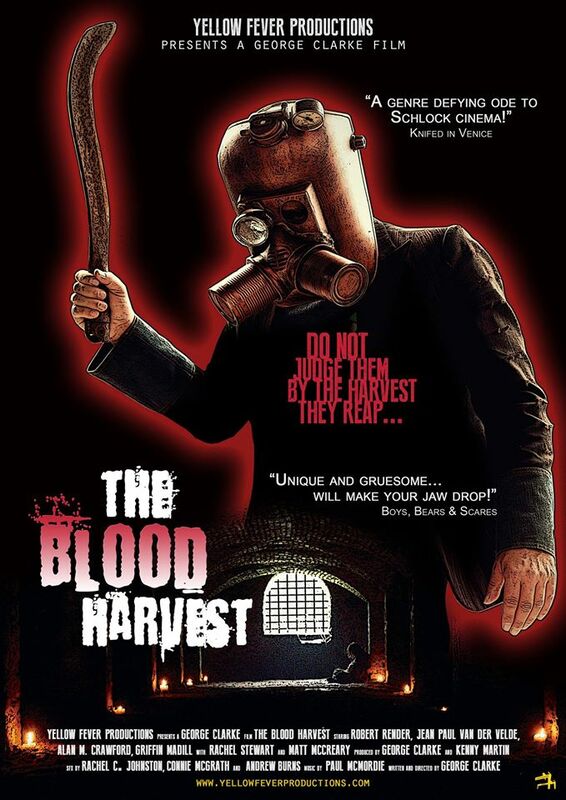 The Blood Harvest, which was directed by George Clarke and is due to be released in the UK on March 1st, 2016, is a serial killer film with a twist. As the film begins, 39 men and women have been murdered in Northern Ireland. Their blood has been drained and, in a touch that would surely be appreciated by legendary Italian horror director Lucio Fulci, their eyes have been mutilated. Despite the hard work of Inspector Hatcher (Jean-Paul Van der Velde) and his new partner, Ward (Griffin Madill), the police are no closer to solving the case than they were at the time of the first murder. The only man who seems to be capable of figuring out what is going on is Hatcher’s former partner, Jack (Robert Render). However, nine months ago, Jack was fired from the police. Now, he spends all of his time sitting in his flat, staring at a map of all the murders, and trying to figure things out on his own. Of course, you’ve probably already guessed that Hatcher ends up going to Jack for his help. What you don’t know and what I doubt you’ll be able to guess without seeing the film is the nature of the big twist that is eventually uncovered. And I’m not going to spoil it for you, beyond saying that I enjoyed it. It was exactly the type of over the top twist that a film like this both needs and demands. It was a big twist that, at first glance, appears to come out of nowhere. But, then you think back, and you realize that there were all sorts of clever little clues littered around the film. I’d love to tell you my favorite clue but, if I did, I would end up spoiling the twist and that would be so unfair. The Blood Harvest is a good and enjoyable horror hybrid, one that rewards observant viewers who are willing to pay attention to all of the little details. (That said, my favorite detail was the cute little cat-decorated cup from which Jack drank his coffee. It didn’t necessarily have anything to with the rest of the film and no, it’s not a clue to the twist that I was just talking about but I still smiled every time I saw that cup on screen and, to me, it epitomized how important the little details can be when it comes to making an effective film.) If nothing else, The Blood Harvest proves just how important location can be to creating a worthwhile cinematic experience. The locations that were used in The Blood Harvest — from those empty tunnels to that abandoned farm to the isolated jogging trail — were all well-chosen and added to the film’s atmosphere of horror and dread. In particular, those empty tunnels were pure nightmare fuel. The Blood Harvest is a well-done treat for lovers of both horror and detective stories. And trust me, after seeing this film, you’ll never look at a fork the same way again.